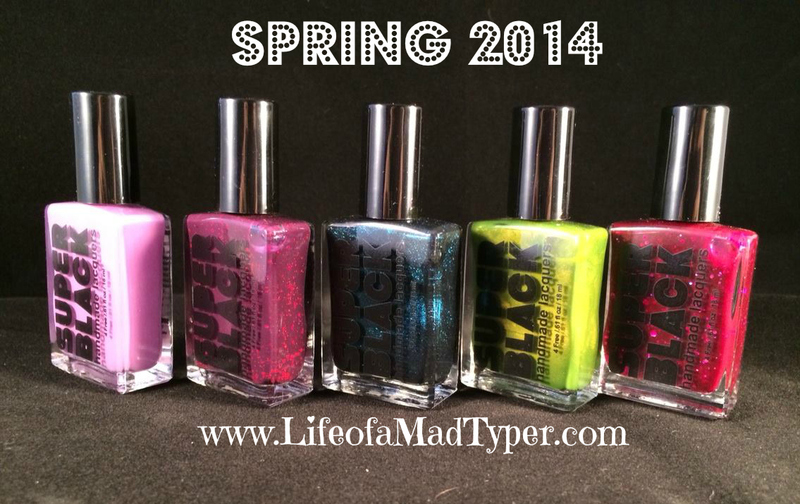 This is part 2 of the spring collection from Super black Lacquers. You can see part 1 here. Application with all 3 was smooth as silk. I love the colors chosen for this collection. 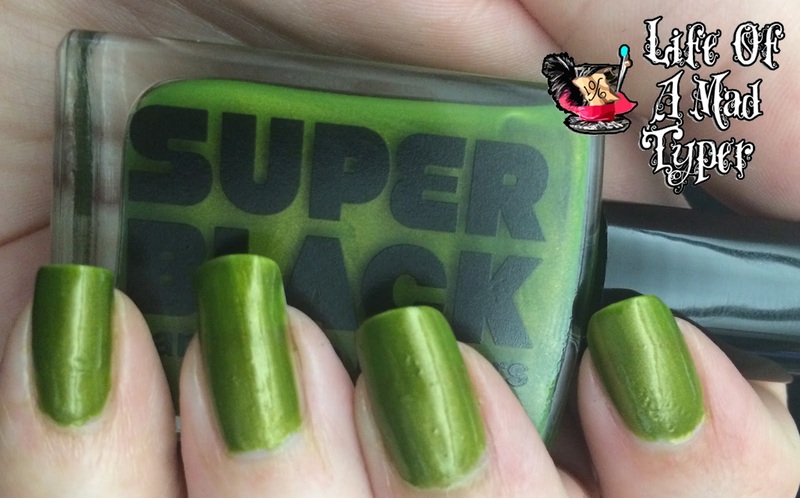 The Stag is a glowy spring green polish with a rich bronze shimmer. Smooth with a subtle metallic sheen, like a beetle's shell. Awesome texture, dries smooth and shiny. Use a top coat if you want, The Stag will be slick either way. I used 3 coats of The Stag with no topcoat and with basecoat. Depending on the lighting this can appear to be an olive green to a neon green. I love the way this glows and shines in the sunlight. The metallic shimmer while subtle is beautiful. 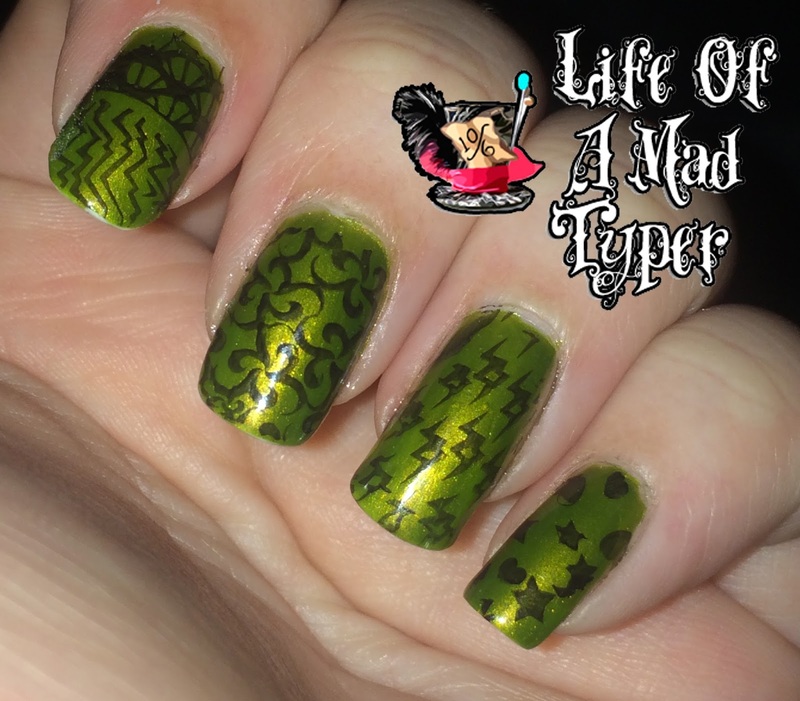 I stamped this polish with a Moyou London stamping polish and the FAIRY TALE plate 03. 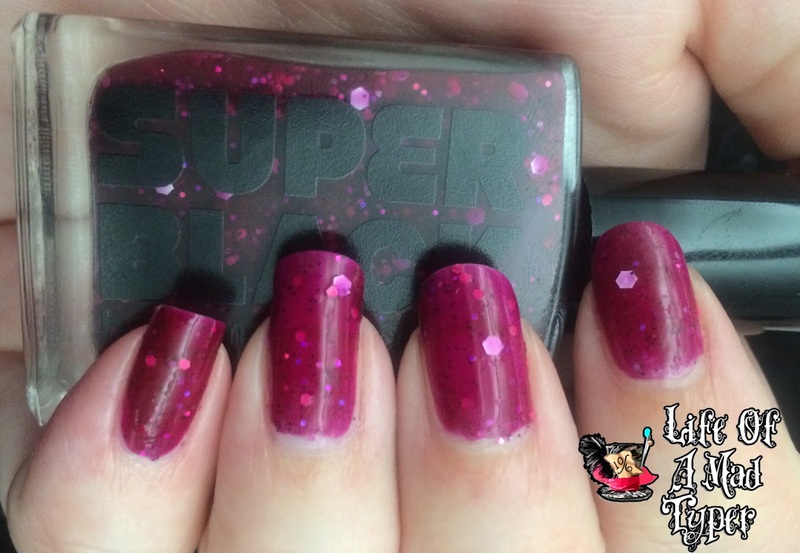 Framboise is a saturated raspberry jelly polish, with a ton of glitters: tiny black, matte pink, holographic lilac, and chunky matte white hex. Sheer enough to show the layers of glitter on your nails, but pigmented enough for opacity in 2-3 coats. Add a top coat to smooth out the glitter... try a matte top coat for a really unique effect. Fans of SUPER BLACK Lacquer's The Bends will love Framboise!! I have to say this is one is my favorite from the collection. It has 2 of my favorite things! Glitter & jelly polish, I actually swatched this one last so I could keep it on. I used 3 coats and love the depth the glitter gives to the jelly polish. 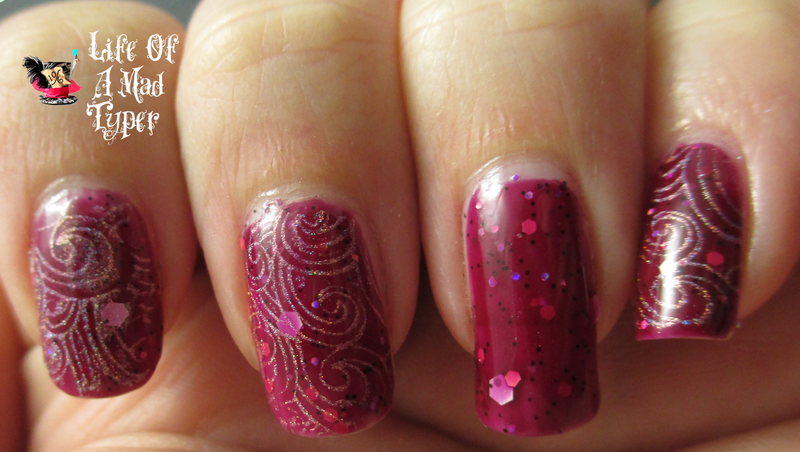 I then stamped this polish with Color club Miss bliss with Moyou London plate FAIRYTALE collection 02. This was my first time stamping with a holo and I love the effect that it gives with the swirls I chose to put over Framboise. The Grackle is a sparkling turquoise blue with a black base. Opaque in 2-3 coats. Pictures don't do this polish justice! Slap on a top coat to smooth it all out. Shimmery and distractingly pretty. 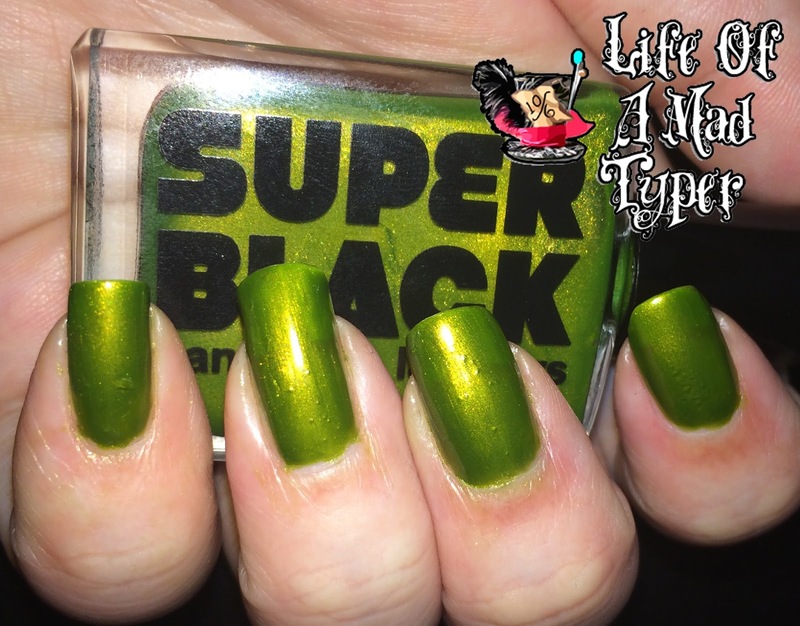 This is one of the perfect spring color for the goth at heart. Dark base with turquoise pop, and you know how I feel about turquoise! I didn't get to grab a shot of this in sunlight because it was raining and snowing but I did get a few shots to show you. Those colors are fabulous!! I want the raspberry one. I am in love with all 3 of those colors!!!! Gorgeous!!! I LOVE all three colors...I can't decide which one is my favorite and it makes me want to go shopping for polish :) Thanks so much for sharing! Absolutely love the Framboise and the designs you made on top of the Stag are really cool! These look like real fun colors for summertime. Can't wait to try them thanks for sharing. I love all the those colors, but I must say that I am in desperate need of that Grackle now. I will have to purchase that real soon. All of the art is really cute as well. Great job. I love the Framboise! You should do a video on how to do the holos you where talking about? Such an amazing set of nails! I wish my nails were that long. I also wish I could wear polish. It just doesn't stick on my nails. You are amazing at nails and I love all these colors!